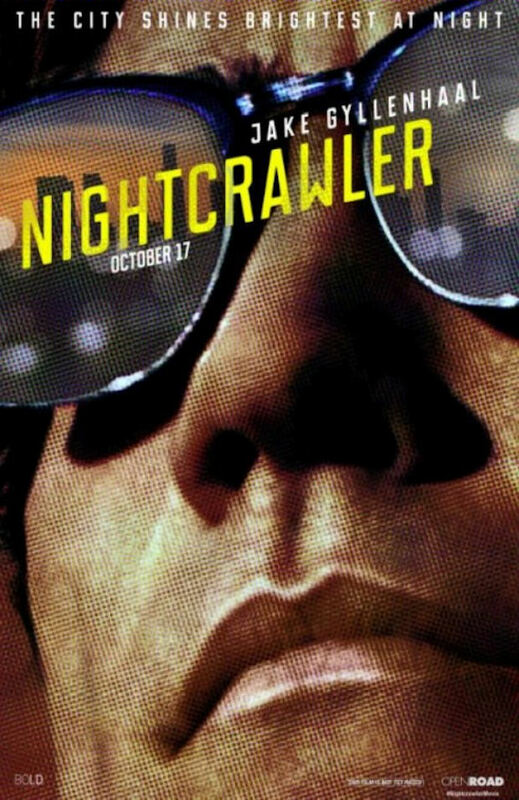 In Nightcrawler, the cinematic directorial debut for Dan Gilroy, we meet Louis Bloom – played by Jake Gyllenhaal – a thief, desperate for a chance at a job. As Bloom traverses the night, looking for a job, he encounters Joe Loder – played by Bill Paxton – who makes a living by selling footage of crimes in the Los Angeles night. Bloom becomes intrigued, and thus begins to climb up the social ladder. But when Bloom becomes an employer, he becomes unhinged. That’s the basic plot, and from this point forward expect SPOILERS for Nightcrawler. I just got back from a theatre in Taastrup, Denmark – and thankfully I was alone in the theatre; therefore I was not bothered at all; which is perfect for a reviewer. Going in I expected a mash-up of American Psycho and The Wolf of Wall Street, but I was unsure whether it was more the former or the latter. Louis ‘Lou’ Bloom is an interesting character, and Jake Gyllenhaal gives an amazing performance here. This isn’t just because of his weight loss, he simply gives us the best performance of his career. I’m a big fan of Gyllenhaal, but I do think this is his best performance – as he transforms himself into an almost metallic Louis Bloom, with Patrick Bateman-like (American Psycho) charm – and Dexter Morgan-like (Dexter) social skills. This is a character-driven story, and Gyllenhaal is the main reason to go and see this film – but it is also important to note that this film in itself is a social commentary on the way the news glorifies violence. In what is an eerie conclusion to the Gyllenhaal-Rene Russo (who plays Nina Romina, a TV-veteran) relationship, we see his footage in the background while Gyllenhaal’s piercing eyes meet the ones of Russo. She is captivated by him, he’s her dealer – and the footage is her drug – or rather, it’s what keeps her working. I really like her performance in this film, and the romantic relationship helps in understanding Louis Bloom’s role. It is incredible to watch Bloom climb the social ladder, and to see him change in front of us – but it is also frightening to see where the want for violence takes him. But he is a fast learner – and he learns from the best. Some things did bother me though, as I found Bill Paxton’s Joe Loder-character to be used poorly. However, the one big thing that bothered me was the score. There are times when Louis Bloom is monologing, revealing his American Dream – and suddenly the score turns this film into something it’s not. While the social ladder is important to this film, this is not a sentimental pursuit of happiness-story; and at times the score muddles the overall plot. The best part of this film is Jake Gyllenhaal’s portrayal of Louis Bloom, and the social commentary is another stellar part of this film. But I would be remiss if I did not mention that I found the film’s final act to be the most thrilling I’ve seen all year. Overall Score: 9 out of 10. Jake Gyllenhaal gives an Oscar-worthy performance in a American Psycho-like film, complete with a thrilling final act and a comment on glorified violence on U.S. local news.